Each September, the Villanova Campus community gathers together to celebrate the University’s patron saint—St. Thomas of Villanova. Thomas was an Augustinian priest of Spanish descent who deeply valued the pursuit of knowledge for the purpose of helping others and was specially known for his devout service to the underprivileged. In honor of St. Thomas and in order to highlight the things he valued and held closest to his heart, the University annually holds a lecture, a day of service and a liturgy. Please see the complete list of events. This year, the 10th annual St. Thomas of Villanova celebration will be held from Thursday, Sept. 10 – Sunday, Sept. 13. The entire Villanova community is invited to attend the related events and services and to also contribute to the St. Thomas of Villanova service weekend. There are several ways to get involved and be a part of this great tradition! One major way to be involved in the St. Thomas of Villanova weekend is by offering your time and energy to help serve our neighbors in need in the surrounding Philadelphia area. The Day of Service organizers rely heavily on those who volunteer to work at local service sites. VU will be partnering with approximately 150 service sites this year! And, although the official service volunteer registration was on September 2, there are still many other ways to help our community this weekend and throughout the entire year. Please see this list of weekly volunteer opportunities for students, faculty and staff. Library staff including Luisa Cywinski, Laura Bang, Phylis Wright and her husband Jack volunteered with a group at the Carousel House near Fairmount Park in Philadelphia as part of the 2010 Day of Service. The success of the St. Thomas of Villanova Day of Service is also dependent on the generosity of others. Please consider donating funds and supplies. 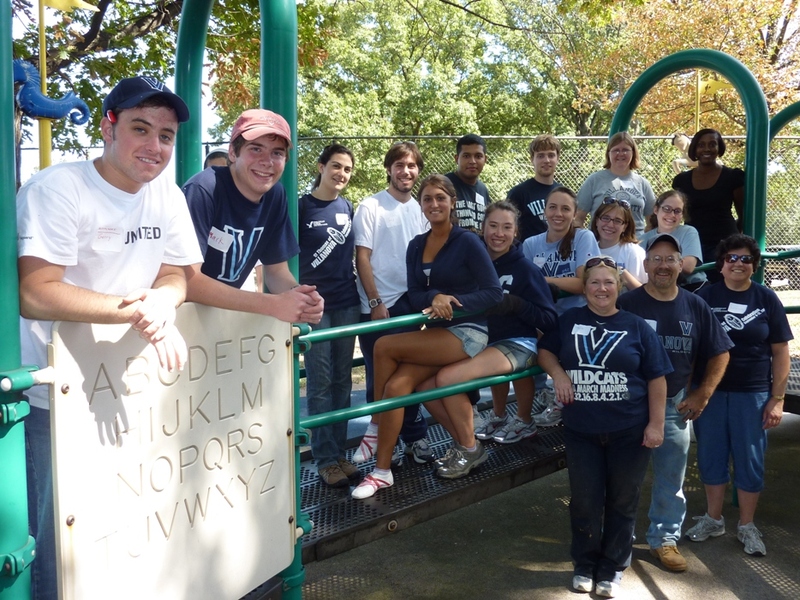 Money collected will help Villanova provide transportation to service sites, refreshments for participants and also help guarantee that adequate supplies are available to help our Day of Service volunteers complete their work. Financial contributions and donations of working supplies would be greatly appreciated. Those interested are invited to reach out to Christine Quisenberry for further details. Additionally, the University will sponsor a campus-wide Community Collection Day in order to meet the needs of the communities in the surrounding Philadelphia area. The collection day is scheduled to take place this Friday, September 11th. This is a great opportunity for our Villanova students, faculty, staff and friends to help support the needs of those less fortunate in the spirit of St. Thomas! Items collected include non-perishable food, office/school supplies, books, toiletries, cleaning supplies, paper products and baby items. Collected items are sent to many of the agencies that we partner with for the Day of Service. If you are able, please consider donating your time, energy, money or supplies to this worthy cause! In the spirit of St. Thomas of Villanova, we are called to serve those in need with a giving heart. Be sure to be a part of this Villanova tradition!